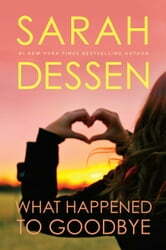 Another great read from Dessen. Another great story from one of my favourite author. The story of McLean is so enticing, you won't want to put it down. She faces real issues, with real feelings. This book is very relatable with her family issues, and how she struggles with her feelings and relationships. What a good read?! I thoroughly enjoyed reading the story of Mclean and her hidden emotional turmoil. Some parts of the book were easy to relate to and I found myself feeling Mclean's troubles. The book had a brilliant ending that made me smile. Sarah Dessen, you never disappoint- this has got to be my favourite!